Sachiko Yasui was a young girl living in Nagasaki, Japan when the United States dropped an atomic bomb on the city during World War II. Surprisingly, she lived through the bombing but her life was never the same. Several members of her family died from the initial attack and many others died later from complications of the radiation. 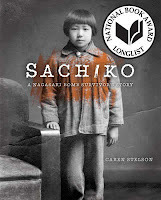 Sachiko managed to move forward with her life and become someone who could speak firsthand about the devastating effects of war and its weapons. This book is a powerful and beautiful account of Sachiko's life and legacy and ought to be read by all young people.